For a consumer, Thanksgiving, Christmas and maybe Easter are likely the only times to think about turkey. 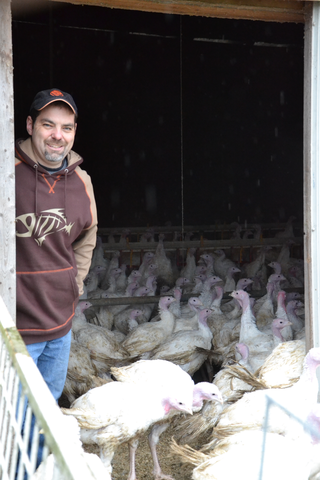 For a turkey farmer, the thoughts—and planning—go on year round. It might be working with quota, assessing animal health or raising birds throughout the year to sell to a year-round turkey retailer. Stats Canada estimates 2,658,000 turkeys were sold in 2015 which is slightly lower than the previous three years, but still a significant market. Modern Agriculture checked in with Trevor Allen of Yarrow-based Skye Hi Farms who is a first-generation farmer (his parents had a hobby farm) raising turkeys. In addition to the holiday birds, he and his wife Donna have dogs, horses, a cat hotel and specialty broilers on their 10 acre farm. 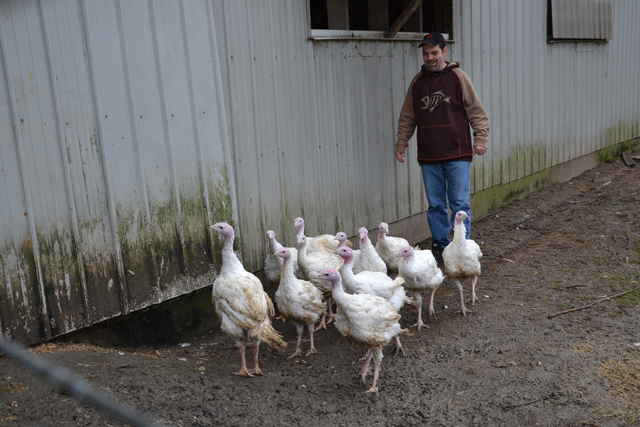 “We’ve purchased a second farm and we’ve purchased another 35,000 kg of turkey quota,” Allen says of the business. Not bad for a guy who started turkey farming at age 14 with a flock of 150 birds. Now, Allen manages 3,500 birds at Thanksgiving and 4,500 at Christmas. Those numbers will increase with the recently purchased additional quota. 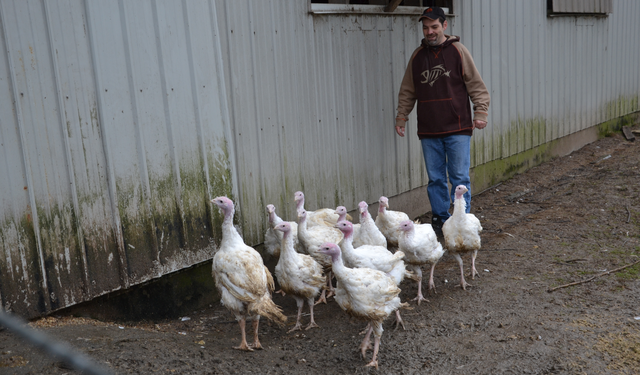 He specializes in hybrid free-range turkeys which don’t grow to the size of conventional turkeys many consumers are used to. Because these birds have access to food at all times, but are not directly in front of it, the two flocks Allen raises at each holiday will grow to about 11 to 13 pounds and 16 to 19 pounds. Turkeys are not caged. Some may be in pens (including turkey laying hens), but the criteria for the birds (like their chicken counterparts) follow certain standards outlined in the BC Turkey Marketing Board, Farm Practices Regulations 2002/2004. “We still have kilogram per square meter regulations,” says Allen of how over-crowding and flock-bullying issues (as sometimes seen in laying hens) are prevented. Allen’s flock is considered a niche flock, but one that falls within the overall conventional quota as mainstream turkey. The only turkey quota outside the mainstream category is organic. His birds are cared for beyond the level of veterinary standards and their welfare is audited by a third party. They are outside as often as they like (weather permitting—animal welfare determines if it’s an in-day or an out-day) on grass with full access to the barn and don’t receive antibiotics—there are no hormones or steroids in any BC turkey. 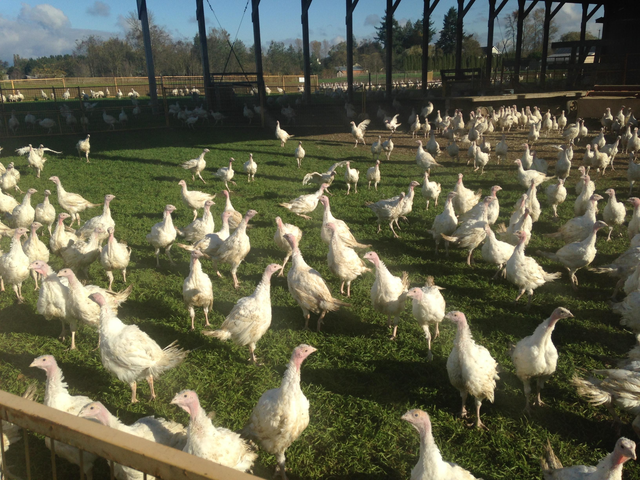 Allen’s birds are sold fresh and cost more than the typical conventional turkey. He sells his birds to about 15 Lower Mainland stores and distributes the others through Meadow Valley Meats. The fresh order process is a bit more challenging as it requires pre-ordering with the stores about five weeks prior to the holidays. “Sometimes there are overages of birds; sometimes we’re short,” he says. While the quota system works to a certain degree, Allen believes a new structure for niche birds needs to be established. The mainstream turkey buyer, the free-range turkey buyer and the organic turkey buyer are all different people with differing demands. A challenge for smaller growers has been processing. Allen recognized the need and has established Country Choice Processing. The Chilliwack-based plant is provincially inspected and will be a welcome addition to the industry which has traditionally struggled with opportunities for small-flock processing. Turkey farming reaches far beyond expected holidays and even seasoned turkey farmers will benefit from taking a look at their operation to ensure they are working towards serving the target market they want to be part of. With the options in mainstream, free-range, hybrid, organic and other categories, growers can select the best fit for their farm.